Long product is a common name for (i) reinforcement steel bars, (ii) shaped steel bar products such as rounds, flats, squares, and hexagon etc., (iii) sectional products such as angles (equal and unequal), channels, beams, tees, and special profiles etc., and (iv) wire rods. Mills which roll long products are known as long product mills. Based on the product being rolled these mills are called, merchant bar mill, bar and rod mill, light section mill, rebar mill, light merchant mill, special bar quality (SBQ) mill, and wire rod mill etc. The product range of these mills usually consists of those shaped and sectional products whose cross-section is smaller than the cross section of the products rolled in medium and heavy section rolling mills. Wire rod mills produces steel wire rods of diameters 5 mm to 12.5 mm in coil form with the weight of the coil upto 2.5 tons. The qualities of steels being rolled in these mills can range from low carbon, mild steel, medium carbon, high carbon, and micro and low alloyed steels. The design of the long product rolling mill is required to provide right solutions for the required performance requirements which include high speed production, microstructure qualities of the product, and shortest changeover time from one product to other product etc. Large amount of flexibility is available in modern long products rolling mills. These mills are normally continuous mills consisting of three sets of rolling stands namely (i) roughing group of stands, (ii) intermediate group of stands and (iii) finishing group of stands. The input material for these mills is normally billet. A billet mill can be combined with the long product rolling mill through a roller hearth furnace in case the available input material is bloom. Similarly on the finishing mill side the mill can be combined with a wire rod mill so that wire rods can also be produced from the mill. There is growing demands on the quality of the long products as well as on the flexibility and cost effectiveness of the long product mills. This has necessitated the development of new and innovative technologies and processes. Modern long product mills are high speed mills capable of rolling bars and light sections of special bar quality grades and engineering steels at high production rates, while keeping investments and operating costs at the reasonable levels. The long products rolling mills can be designed to produce a (i) single product such as reinforcement bars, (ii) bar products, (iii) sectional products, (iv ) wire rods in coils or (v) multiple products which can consist of various combinations of first four types of products. Some sizes of the reinforcement bars and bar products can be produced in coil form in these mills if required while other products are produced in straight lengths. Also, the products of the mills can be either merchant products or special bar quality products. The long product rolling mills can also be designed as a single strand mill or two strands mill. In two strands mills, rolling in roughing group of stands takes place in two strands and in such mills there are two sets of intermediate and finishing stands where the rolling takes place in single strand. In reinforcement bar rolling mills, slit rolling can be incorporated. The mills can incorporate multi slit rolling (MSR) which means that two or more reinforcement bars can be rolled simultaneously from a single billet. Slit rolling is generally used when rolling reinforcement bars of smaller diameters. When compared with the conventional single strand continuous rolling, MSR has reduced number of passes. The mill capacities can vary widely depending upon the products to be rolled, size and quality of the products, size of the input material (cross section and length), capacity of the reheating furnace, rolling rates, the maximum rolling speed, and the number of shifts/days operations. The capacities of long product rolling mills can vary in the range of 300,000 tons per year to 800,000 tons per year. The rebars mills can be designed with capacities of over 1 million tons. Modern long products mills are usually installed at higher levels (around + 6 m from ground level). This is done so that all the facilities such as oil cellars etc. can be installed at ground level for ease of operation and maintenance. The layout of the mill is very important since the mill performance is very much dependent on its layout. There is to be minimum distance between the two equipments. However, it must meet the requirements of the technological processes. 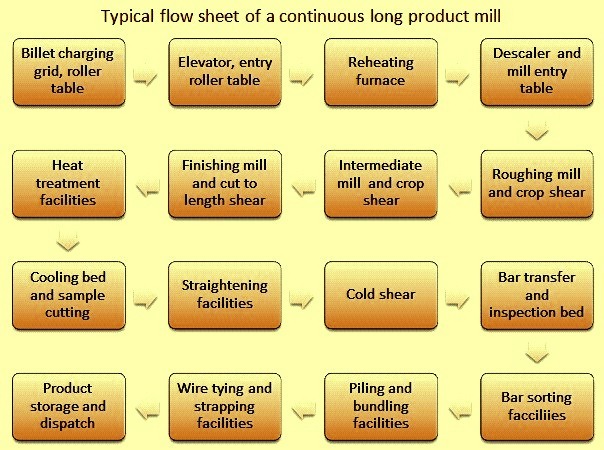 Typical flow sheet of a continuous long product mill is shown in Fig 1. Technologies and equipment of these rolling mills are designed for improved quality and features of rolled products, enhanced performances and operational consistencies. The modern mills incorporate automation systems which are integrated with the technological and mechatronical aspects. There are no manual controls and human intervention in the rolling process is also minimized. Automation levels in modern mills are generally at level 2. In some mills automation level at level 3 is also available. Modern long product mills can also be designed for thermo-mechanical rolling. Thermo-mechanical rolling is also known as low temperature rolling and is basically a method for on line control of the final material properties during the rolling process. It involves material deformation applied at the last passes of the mill, within the temperature ranges corresponding to partial recrystallization or to suppression of recrystallization. Due to it, superior quality product with improved metallurgical and mechanical properties can be obtained directly at the mill itself just by operating at lower rolling temperature. As soon as recrystallization is suppressed, grain refining phenomena occurs, resulting in improved technological properties of the final product. In addition, the surface quality improves considerably. The advantages of thermo-mechanical rolling are fine grain size, avoidance of off line normalizing, improved low temperature toughness, better properties after heat treatment for case hardening steels, shorter annealing time for spring steel, improved fatigue strength on the final component, higher tensile strength for micro-alloyed steels achieved directly in-line, and reduced decarburizing depth etc. Modern long product rolling mills are required to meet the following requirements. High mill availability coupled with high productivity and high yields. Meeting the need of low maintenance. Meeting the need of lower energy consumption. Negative tolerances (In sectional weight). No variation in dimensions throughout the length. The important parameters for rolling in the roughing, intermediate, and finishing group of stands in the rolling mill are temperature, percentage of reduction in area, inter-pass time (time between each stand), true strain, and strain rate. Typical figures for these parameters are shown in Tab 1. Since cross-sectional area is reduced progressively at each set of rolls, the rolling stock moves at different speeds at each stage of the rolling mill. A wire rod rolling mill, for example, gradually reduces the cross-sectional area of a starting billet (e.g., 150 mm square, 10-12 meters long) down to a finished rod (as small as 5.0 mm in diameter, 1.93 km long) at high finishing speeds (up to 120 m/sec). The final dimensional quality of the rolled product is determined by the rolling stands within the finishing mill. The dimensional accuracy in the final product depends on many factors including the initial stock dimensions, roll pass sequence, temperature, microstructure, roll surface quality, roll and stand stiffness and the stock/roll friction condition. Equipment in a modern long product rolling mill can be divided into following categories. Billets are brought to the mill floor level by elevator. Roller tables are normally used for the movement of rolling stock in the mill. Rollers are usually driven by group drive. Modern long product mills are generally equipped with energy efficient walking beam or walking hearth furnaces which are normally computerized controlled. These reheating furnaces uniformly heat the billets to the target temperatures at the required production rates and without skid marks and without cold spots. These furnaces are capable of receiving cold or hot billets as the charge material in the furnace. The modern reheating furnaces have the features of (i) superior heated billet quality, (ii) better heating efficiency, (iii) very low fuel consumption, (iv) minimum scale loss, contributing to achieving high material yield, (v) low decarburization and hence suitable for higher quality steel grade, and (vi) maximum operation flexibility and good working conditions even at low productivity. These furnaces have high burner turn down ratios so that the furnace can be kept on minimum fuel when the mill is not rolling due to some reason. Rolling equipment consists of roll stands, rolls, chocks, bearings, drives, and entry and exit guides. In the modern long product mills, it is common to use a series of rolling stands in tandem to obtain high production rates. The stands are grouped into roughing, intermediate and finishing stages. The roughing mill is generally arranged with horizontal and vertical stands. These roll stands can have cantilever or housing less design. Intermediate mill is also generally arranged with horizontal and vertical stands of housing less design along with quick-changing device. In the finishing mill either combination of horizontal and vertical stands or combination of horizontal and convertible stands are used. Cantilever roll stands are compact stands which are used in a wide range of sizes for a variety of applications. These applications include (i) single strand mills in horizontal and vertical arrangement, (ii) in split intermediate trains of two or more strands mills, and as pre-finisher stands in wire rod delivery sections. The advantages of these stands include (i) small foundations; (ii) cassettes of the same stand type are interchangeable even between horizontal and vertical stands, (iii) high load bearing strength even with small diameters hence ideally suited for high speed wire rod blocks, (iv) optimum accessibility, and (v) fast roll and stand changing. Housing less roll (HL) stands are normally used these days in roughing and intermediate group of stands in modern long products mills. The modular design permits the use of HL stand cassettes in all possible configurations such as horizontal, vertical, tiltable and universal configuration. The stand sizes differ, depending on the necessary dimensions of the rolls and roll journals, pass schedule, pass form as well as the gearbox and motor characteristics. The main features of the HL stands are compactness and rigidity of components, low roll bending modulus, durable multi row roller bearing with self-aligning chocks under load, backlash free balancing of chocks, roller beams designed for simple and exact adjustment of guides and guards etc. The advantages of theses stands include (i) saving in the depth and size of the foundation (ii) the rolled product meets the required form and dimensional tolerances, (iii) there is time savings for stand changes as the roll changing takes place outside the rolling line, (iv) there is significant reduction in time for maintenance due to lesser number of components and easier accessibility, (v) automated roll gap adjustment, and (vi) operational flexibility since the same stand unit can be used in any position. Reducing sizing mill (RSM) is a versatile sought after rolling technology these days for the long products mill. It is also known as precision sizing mill. From existing conventional rolling mills, it is difficult to meet the requirements of close tolerances. This can only be met with difficulty and at the expense of loss of efficiency, especially with regard to the loss of mill utilization time and lower yields. At times this is not feasible or cost prohibitive. In conventional roughing and intermediate mills, the tolerance of the finished product is influenced mainly by the variations in the cross section of the feed material into the finishing section of the mill. RSM takes advantage of the special features of the 3-roll technology, in which the spread during deformation is low and the deformation efficiency is high. The advantages of the reducing sizing mill are many. RSM is installed in the mill line for the purpose of rolling any desired finish size to very close tolerances. It is possible to adjust each roll gap under load and it can be fully automated. In the long product rolling mills, guide equipments guide the rolling stock at the entry and the exit of the roll pass so as to have smooth rolling of the rolling stock. The guiding equipments are to be sturdy, accurate and stable. Rolling mill guide equipments play a major role in ensuring the surface quality of the rolled product. The guides are to be designed for the wide variety of stock sizes and shapes which are normally encountered in the long product rolling. In modern long product rolling mills roller guides are normally used both for entry and exit guides. The design of roller guides is based on rolling frictions and hence these guides have a number of advantages over static guides whose design is based on sliding friction. Roller guides ensures faster and accurate adjustment of the guiding elements when compared with the static guides. Since the contact of the rolling stock with the guide is carried through the rollers working on rolling friction, it becomes possible to considerably increase the wear resistance of the working elements (rollers) and to reduce the possibility of such rolling defects like scratches, laps, and score marks etc. Rolls are the main and very costly consumables in a rolling mill. They are used to roll steel in the rolling mill and their performance depend on many factors which include the materials used and the loads to which they are subjected to during service. The roll design is influenced by the limitations applied by the rolling load, the roll strength and the torque available for rolling. Types of rolls used in the long products mills are given in Tab 2. Roll pass design is an essential part of long product rolling process, since the long products are rolled between the shaped rolls in the long product rolling mills. Roll pass design generally means the cutting of grooves in the roll body through which steel to be rolled is made to pass sequentially to get the desired contour and size. The primary objective of the roll pass design is to ensure production of a product of correct profile within the tolerance limits, free of defects, with good surface quality and the required mechanical properties. In addition, economic condition must be achieved while rolling the product, for example, maximum productivity at the lowest cost, optimum energy utilization, easy working conditions for the rolling crew and minimum roll wear. Roll bearings typically encounter very high radial loads and varying degrees of axial load while running at slow to high speed. The bearings need to have enhanced contact surfaces, material strength properties, and internal geometry and cage characteristics for accommodating these operating conditions. The basic requirements of roll bearing include (i) high continuous load capacity, (ii) low coefficient of friction, (iii)) a design permitting a large and strong roll neck, (iv) minimum wear, (v) simplicity and ease of maintenance, (vi) high reliability, (vii) a design permitting quick and easy interchangeability from roll to roll, (viii) stability of operation, and (ix) precision design and manufacture. The bearings of the rolls are to provide high performance so that the mill downtime can be reduced. Modern long product mills normally use tapered roller bearings for rolls since these bearings can support both radial and axial forces due to the inclined position of the rollers. Four-row and double-row tapered roller bearings are used in rolling mills. As the bar progresses through a continuous mill where the bar is rolled in multiple stands simultaneously, the stand speed must be controlled to ensure tension free rolling. The main methods of controlling the tension in the mill is with a tension free rolling speed control system and manually monitoring the current drawn by each motor as the bar proceeds through the mill. A looper table can be used to aid in keeping the bar tension free between stands. The looper table uses a persuader roll from under the bar to create a loop. The loop height is monitored by a hot metal detector in the slots on the backside of the table. This is a vertical looper. Horizontal loopers also exist where the loop forms on a flat table off to the side of the rolling line. Equipments for heat treatment are usually provided for rolling of reinforcement bars as well as for the rolling of wire rods. In case of rolling of reinforcement bars the bar leaves the final mill stand. The bar is rapidly and energetically cooled (quenched) with water through a short cooling installation, where it undergo surface hardening. At this stage the surface layer is converted into martensite while the core remains austenitic. In case of rolling of wire rods controlled cooling conveyor system is one of the important equipment for achieving the desired properties of the wire rods for a wide range of different steel grades. The optimum combination of speed, fan power and cover position on the conveyor enables processing in a wide range of conditions, including both fast and slow cooling modes within a single system. This capability enables wire rod mills to produce a broad spectrum of plain carbon and alloy steels, as well as stainless steels and other specialty grades. During ‘forced cooling’, air is blown through the loosened windings with maximum power and open covers to cool the wire rods as quickly as possible in order to achieve the laminar pearlite. During ‘delayed cooling’, the wire rod loops are transported without fans, with the cover closed and at low conveyor speed in order to keep the temperature in a given range for as long as possible. This enables achievement of a ferritic/pearlitic microstructure of the wire rods. The results are improved as rolled rod properties. This enables the production of more grades in a directly usable condition, thus reducing or eliminating downstream processes, such as spheroidize annealing. Hot shears are used in the long product mills for front and tail end cropping, cobble cutting and dividing. Crank, rotary and combined shears at different speed ranges are generally employed optimize front and tail end cropping, cobble cutting and dividing. Depending on the mill requirements the shears can be used along with pinch rolls and auxiliary chopping shears. Several types of shears can be employed by a mill to cut the product as it rolls, as it exits the finishing stand, and cold shearing before stacking or bundling. Depending on the product shape and material grade, shears may be used to cut the front of the bar as it proceeds through the mill. These are typically flying shears. The blades of this shear move parallel to the bar during the cut. In multi-strand rolling of rebar, there is a requirement of a shear in the mill which provides a clean front end of the bar to avoid cobbles at the slitting stand. Certain grades, such as leaded steels, require front end trimming to prevent cracks at the front end from splitting open and the bar wrapping the rolls. A drum type shear is generally used for product with a simple shape such as flats or rounds. The blades are mounted on a rotating cylinder (or drum) and are set at a ‘lead’ speed to minimize the ‘kinking’ of the bar. After the shearing to length and cooling to ambient temperature on the cooling bed, the bar needs to be cut to sale lengths. For most products this occurs at a cold shear after the cooling bed. Smaller products exit the cooling bed in multiples so that a row of product is cut at the cold shear. The size of cross section cut by a shear depends on its rating of the maximum cutting force. The stroke of the blade must be large enough for the largest height product. The product hold down must also clear this height, and then move into place to hold the product steady. For structural sections, shaped shear blades are used as well as shaped entry rolls or guide plates to align the product to the shape of the blades. Several types of cooling beds are used for long products. The long product bar as it enters the cooling bed slides onto the first notch on the rakes. The initial notches provide continuous support for the bar on a casting called a grid casting. Long plates with notches set at some distance apart, support the bar after it moves beyond the grid castings. The bar moves across the cooling bed ( say from right to left) by the movement of alternative plates moving in a cycle of lift, move, and retract, by the action of eccentric cams. Repeating of this cycle moves the bars as they are delivered from the mill. The length of the cooling bed is determined by the maximum run-out bar length, optimized by the selling lengths to minimize crop losses. The width of a cooling bed is determined on the basis of mill productivity (tons/hour) and the time required for cooling. Walking rack type cooling beds are used in modern long product mills. The purpose of the cooling bed of a movable rack design is to uniformly air-cool the rolled bars or light sections and transport the same in a phased manner from the entry of the cooling bed to discharge side. The front ends of the bars and light sections are also leveled at the discharge side and a fixed number of rolled pieces sent for final length cutting by cold shear and bundling or stacking. The movable rack type cooling bed is normally of a walking beam design. The mechanism ensures that the bars and light sections are uniformly positioned over the toothed racks. The cooling bed is usually designed considering the smallest and the maximum size of the bars and light sections being rolled, delivered from the finishing stand of the mill, and the cooling time required for the various sizes of the bars and light sections. Rack type cooling bed design depends on bars cut previously to given lengths, to slow them down, to transport them crosswise over a cooling surface ensuring that the rolled bars or light sections in very wide range of lengths, are kept as straight as possible, to collect the bars or light sections at the end of the cooling surface to predetermined packs matched to the requirements of the cold shear, and to discharge finally same onto a roller table which conveys the packs to the cold shear. After cooling structural sections are typically straightened in a roller straightener and cut to sale length by a cold shear and either stacked or bundled. In case of stacking of angles, they are stacked in a two down, one up arrangement. After the bundle is stacked it is banded and moved to the shipping bay. A number of solutions are available for the finishing of bars and sections in the finishing area of the mill. A typical bar mill would include a cold shear with gauge beam while a section mill would have a straightening machine feeding to cold shear. Correct layer preparation is the key to productivity and this is achieved by profile feeding system. Flying type cold shears are also used when the rate of productions are high from the mill. Multi line straighteners are used at high productivity rates. The concept is to straighten cooling bed lengths in order to have less feeding operations and better utilization of the straightening roll drives. Proper alignment and centering of the bars under the rolls is essential. The recent improvements in this area are (i) use of automatic section feeding to the straighteners, (ii) quick change of roll sets mounted on a stand by carriage, motorized roll gap arrangement, and (iv) the whole unit is mounted on a platform that can be shifted out of the line for maintenance without stopping mill production. Further in order to pre-align the bar layer on the cooling bed run out roller table, a chain transfer and a carriage type extraction system is usually provided so that the bars are inched out of the bed racks at the required centerline distance between the bars and kept this way by gentle depositing on the run out roller table with the carriages. The bundling and stacking section of the mill can also have many solutions. A typical solution consists of a simple bundling machine while for sections magnetic stackers are the norm. All the operations are to be mechanized and automated including the removal of the short bars or the labeling in ideal scanning position of tags. Special care is normally given to the final shape of the bundles, with optimum arrangement of the bars and sections. Stackers can have different designs depending of the requirement. For precise stacking of the light sections the overhead pendulum system is used while for light medium sections, the stacking system with magnets underneath is used. The bar counting system consists of automatic bar counting which operates on an optical principle and separation system for forming bundles. The separation system is composed of three fixed chain transfer devices between which the counting system is installed. The optical device together with a pulse generator installed on the chain transfer drive performs the counting and recording of Each single bar in transit without overlapping or double reading. Modern long product mills have tying and strapping machines for bundles and piles. These machines are designed for continuous operation, Tying machines use commercial size wires cfor tying and the machine head is hydraulically operated. The strapping machines are pneumaticaly operated and use commercial steel straps of different available width. Strapping can be carried out either by clamping or welding. Mill electric system consists of transformers and switch gears, DC (direct current) and AC (alternating current) motors, variable speed drives for the motors, motor control centres, field sensors, instruments, and actuators, control panels, control desks, and control pulpits etc. The mill automation is provided to carry out the reliable rolling with minimum of human interventions. The mill automation level can be at level1 or level 2. At level 1 which is the basic level of automaton, the automation includes programmable logic controller (PLCs), Human machine interfaces (HMIs) for operation and monitoring, SCADA (supervisory control and data acquisition) systems, as well as process and production control computers, all in centralized or distributed topology, interconnected via field bus and local area networks (LAN). The mill automation carries out several functions. Some of them are described below. Main control desk, with management function mode and rolling speed calculation. Regulation cascade speed between stands. Cascade control uses the reduction concept (R-Factor) to calculate the mill cascade speed reference. This parameter, directly related to rolling fundamentals, simplifies the setup and operator control. During production the loop and tension control automatically adjust the R- Factor, ensuring minimum material stress between the stands. Impact speed drop compensation. The system speeds up the stand during the head threading, reducing the speed drop when the material impacts the rolls. Once the bar is inside the stand, the control changes back to the mills cascade speed reference. Minimum tension/loop control between stands. Tension/loop control between the stands reduces the material stress along the mill and it helps in improving the dimensional accuracy of the product. Shear cut control for cropping and cutting processes. The performance and accuracy of the shears in a mill is critical to increase the yield and avoid problems when the bar enters the stand. Automatic cobble detection is usually designed to help operators react faster to unexpected events and continuously track the bar. If a cobble occurs, the system automatically reacts to minimize the effects by commanding the upstream shears to chop the existing bars blocking the furnace from sending another billet. Auxiliary equipments in modern long product mills include descaling equipment after the reheating furnace, pinch rolls, roll cooling equipment, roll/stand changing facilities, product straightening equipment, sample cutting, inspection and cutting facilities, lubrication facilities, hydraulic and pneumatic facilities, roll assembly and dissembling facilities, roll turning facilities, guides preparation facilities, storage and handling facilities, communication facilities, water treatment facilities, and scale pit etc.